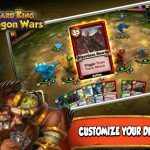 Card King: Dragon Wars is an insanely great and free card battle game from Crooz, and at the moment it is only available on the iOS platform. Like many other games of this sort, you get to deal with mythical warriors and wizards fighting against monsters and other enemies. 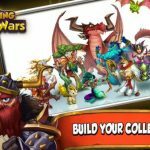 You can choose if you want to control a strong Warrior or a spell-casting Wizard when you choose your avatar, and when it comes to the army you can have at your disposal, there are dragons, knights, and elementals, each with their own special abilities. 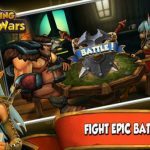 Building a deck in this game and getting three-star ratings may be tough if you’re starting out, but our Card King: Dragon Wars cheats, tips and hints can definitely simplify the process for you. The Global Missions are the best and fastest way for you to get free Dragon Stones, or gems – this is the game’s premium currency. Daily Missions are also worth checking out when it comes to gathering gems. Once you’ve got enough Dragon Stones accumulated, that’s when you can go for a premium card and see how your luck holds up. You certainly would want one of those four- or five-star cards coming alive and helping you out. You don’t want to run off to battle without adding a Helper to your deck. These creatures can be real game-changers, with even one Helper capable of determining your success or failure in a battle. In the game’s mechanic, they won’t count against your lost creatures, so you can still get three stars even if they get killed. The moment a card battle begins, so does your use of strategy. Starting out on the right foot could really serve you well. For instance, it’s not good practice to play an offensive card first, as that could cost you more energy and end up with said card taking damage early on. You may want to start with a Support or Shield card instead, and stick to that card as you build up your deck and play more cards over time. Generally speaking, you want to start with a couple strong cards, and make use of Drag Attacks with your cards while your energy is still low. You want to utilize all your energy points when on the attack – this would allow you to take full advantage of your action cards, and also contribute to your Drag Attacks. But you shouldn’t use cards just for the heck of it either – timing and strategy would allow you to have the most dramatic effect when playing cards.